Welcome to Part 2 of Blog number 19. Due to the good weather we've had recently (which has now disappeared), I had a big backlog of pictures to process which in turn delayed writing the blog. If you missed part 1, please follow the links on the right to June 2012 or click HERE﻿. Following the rather long day spent in Northamptonshire, I had an easy day at work on the Wednesday, and on the Thursday had to make a quick trip to Edinburgh. Seeing a lot of people wielding cameras standing on the suburban stations on the approach to Edinburgh made me wonder if there was a special train about, and indeed as I arrived at Waverley a class 66 was approaching from the opposite direction with the LNER A4 'Bittern' in steam on the rear . I wandered up the car park to see if there was any possible chance of a shot as it was leaving, and found just one other photographer standing on a large lump of concrete to get height above the fence. Rarely do you manage such luck, as I got this shot of it leaving and was still on my train home just 25 minutes after arriving. 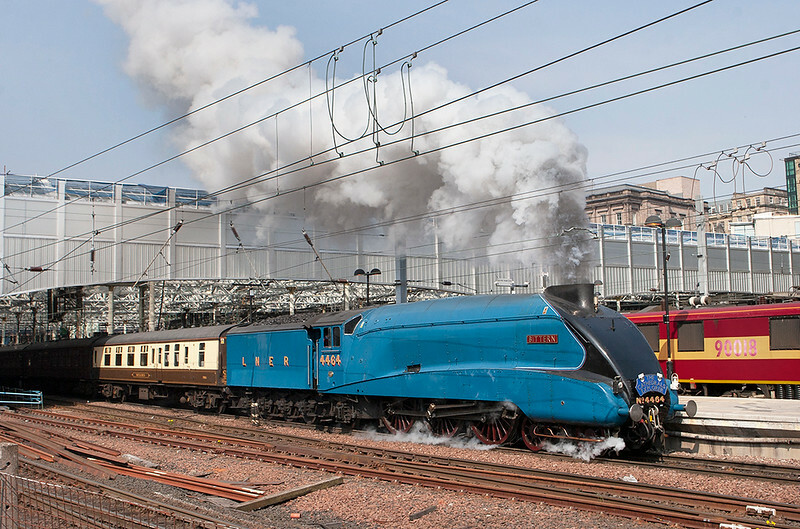 I'm not the greatest fan of East Coast engines, be it Deltic's, A4's or replica Tornado's, but I must admit Bittern did look impressive pulling away on its old line. With the weather still sunny I went out in the car after work to Charnock Richard. Whilst this is a bridge on the electrified West Coast Main Line, the wires are not too obtrusive, although the trees overhanging the old slow lines are starting to restrict the shots. 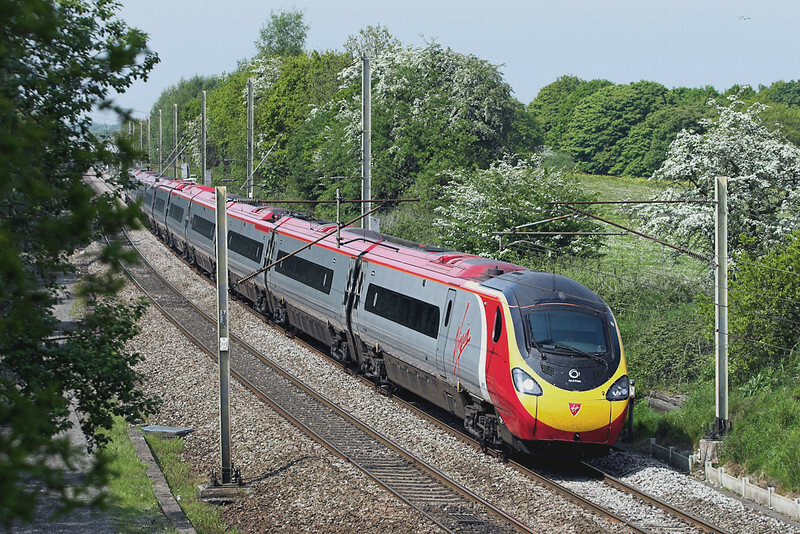 This is my first shot of an 11-car Pendolino, though the tree hides the extra length. This train had disgraced itself failing at Weedon two days earlier and indeed this working got terminated at Watford due to a train fault. 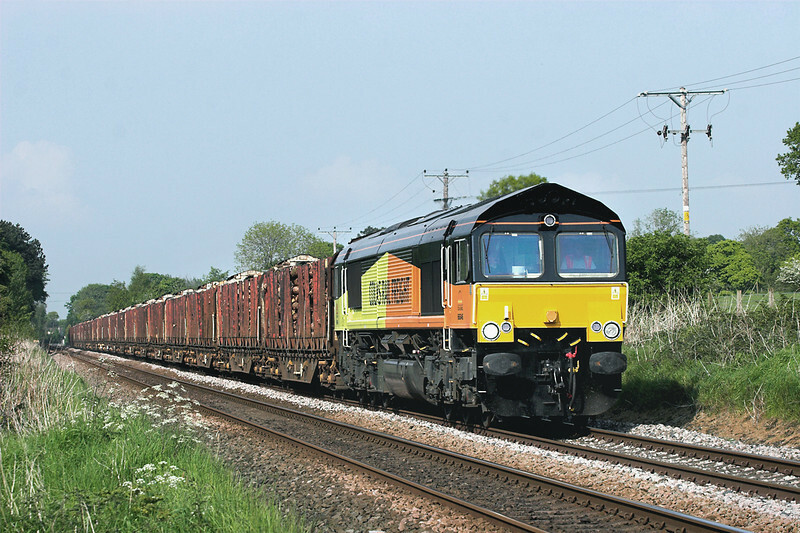 The regular Scotland to Fiddlers Ferry coal train had failed at Hellifield with the class 70 overheating, which in turn delayed the other two regular freights that take that route between Carlisle and Wigan, namely the 6K05 Departmental and 6J37 Log Train. The steam engine 'Princess Elizabeth' with its support coach was also running late heading north to Hellifield, (presumably in connection with the tour 'Bittern' was heading), so I calculated I would have time to photograph, enroute to Brock for 'Lizzie', the Log Train at Mintholme near Hoghton. This is a new spot for me for this train, and was only really possible with the sun at the correct angle due it running 60 minutes late. As I arrived at Brock, Princess Elizabeth was approaching Preston where her driver decided she needed a drink, so it was another hour or so wait until it came past. By this time there were clouds springing up, and indeed when I recieved word that it was leaving the loop at Broughton 3 miles south of where I was, a cloud moved over the sun. However it cleared in the nick of time, and also stayed clear for the southbound DRS Nuclear Flask train which passed 5 minutes later. 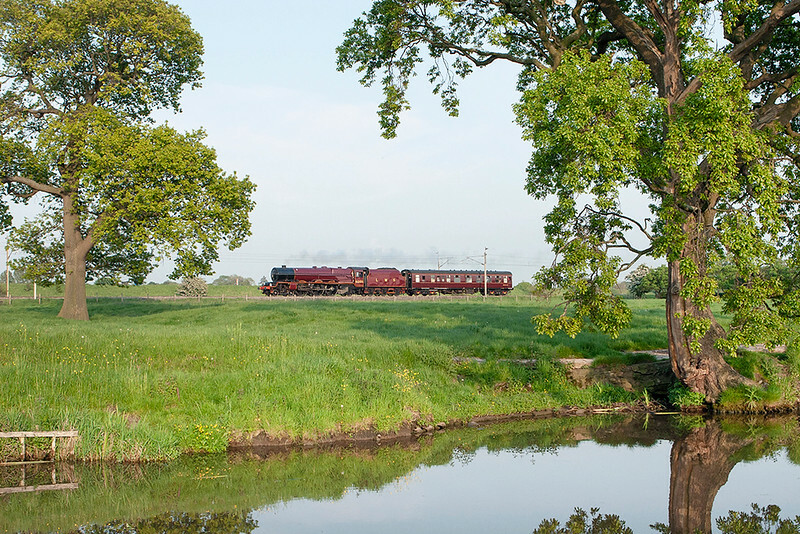 It's not often I photograph even one steam train in a day so to get two, both in full sun and without being surrounded by hundreds of other photographers, was quite unusal. And that was it for the weekend, which was mainly taken up working. Last Tuesday however I decided to go for a decent trip out again. I had a couple of places I was interested to visit, and the best forecast the night before was for South Wales. I headed out to Crewe intending to catch the 0711 to Newport, but on the way realised that 30 minutes or so after this the faster Arriva Trains Wales 'WAG Express' was due. 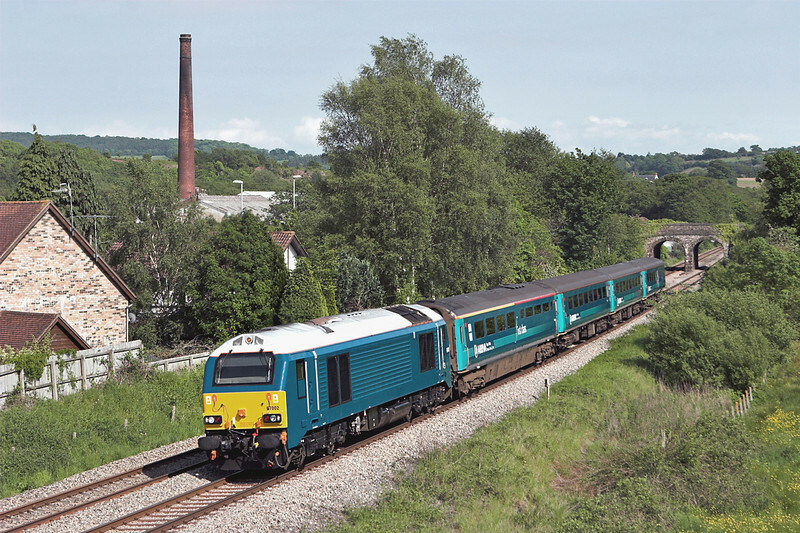 This class 67 hauled train was my main photographic target for the afternoon, but a ride on it was worth the 12 minute later arrival at Newport. Amazingly this train runs non-stop from Shrewsbury to Newport and is an excellent way to make the journey. You can even order a full breakfast at the buffet and the steward will deliver it on a proper plate, with proper cutlery, to your seat. A shame I had already got muself a sandwich from a shop at Crewe! My first location to visit was Magor on the main line between Newport and Severn Tunnel Junction. The original plan was to get the Newport Transport service 62 which is infrequent and takes about 50 minutes, however I worked out Stagecoach run hourly direct so went for that route instead. Newport's day ticket is good value at £3.50, and I needed one of those anyway for later, but reckoned it wouldn't be too much for a return on the Stagecoach bus. Wrong - it was almost £6!!! I had an enjoyable 3 hours at Magor, with a couple of freight trains passing by and a procession of HSTs, class 158s and 150s. 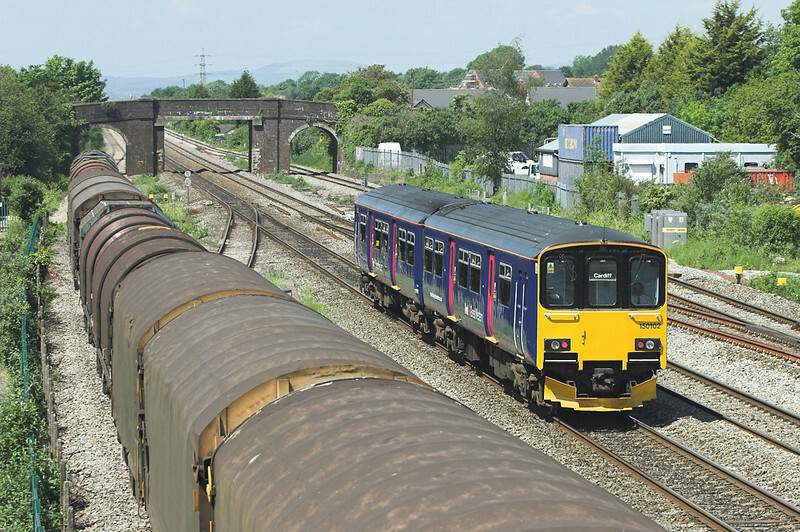 The latter class, operated by both Arriva Trains Wales and First Great Western, tend to be on the hourly trains to Cheltenham and also the ones to Bristol and beyond. After Bristol these go to a variety of destinations, including Weston-super-Mare, Taunton, Exeter and even Penzance! Ex-London Midland 150102, seen above and up until recently used on Birmingham local services, started it's journey at Penzance at 0600, and 6 hours later when it passed me Cardiff was still another 25 minutes away. I hope noone had to make the whole journey on it. I used the return portion of my expensive Stagecoach ticket to get back to Newport where I had an hour or so visiting the local Wetherspoons. There are actually four in the town, which seems rather a lot. 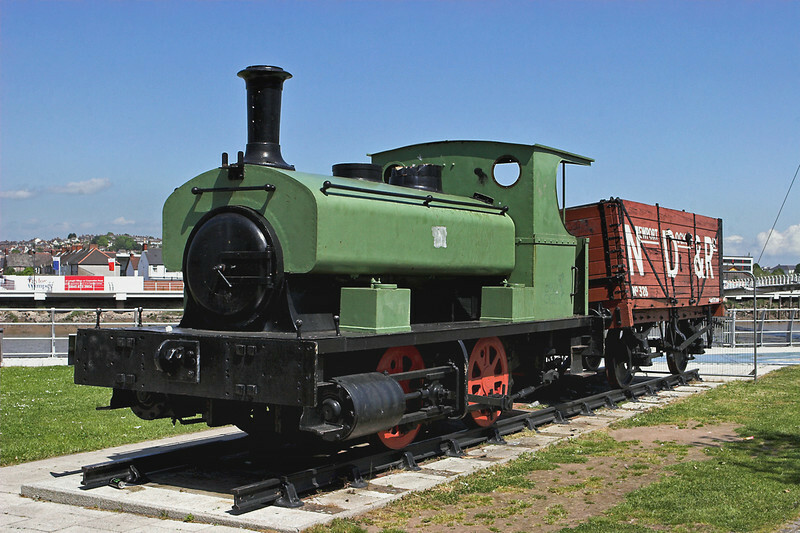 It was worth though a quick diversion to see this Andrew Barclay old industrial shunting engine which is 'plinthed' by the river opposite the bus station. I'm told it was delivered new to the Newport Tinplate Company at Abercarn near Caerphilly and spent its final years at British Steel's Ebbw Vale plant. If the wagon looks like it has been derailed, its funny angle is actually because it's wooden chassis has unfortunately totally collapsed on the other side. 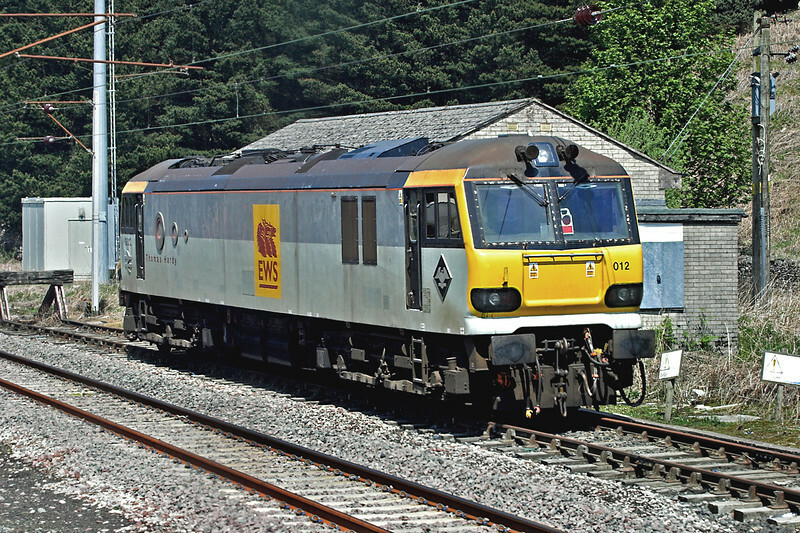 My next destination was Ponthir, which is on the line between Newport and Cwmbrân, to photograph the return WAG Express. This was a place the RPG Photographic group had visited on their previous day out which I'd been unable to attend. The forecast had been for clouds in the afternoon but quite amazingly it stayed sunny whilst I spent a pleasant hour sat overlooking this fantastic location. Newport Transport service 28 runs twice an hour to Caerleon and stops near the bridge in the background, but the hourly 29 crosses it to Ponthir itself, and onto Cwmbrân, which was my way to get to the station for the train home. Another quick pint in the Wetherspoons there, and an hour for some tea in their branch at Leominster, finished of another good day. The days pictures are HERE. So, finally, I've caught up with both my picture processing. A week of nights at work beckons now before a week on holiday so there may again be a bit of a break before I get to write edition 20.. As I promised on Blog Number 18, an update on the '92012-watch'. Well, last week it was still dumped at Shap Summit on an increasingly rusty siding. Will it make 3 months there?! Thanks for reading.